My son Isaac has been a dream baby from day one. He is so perfect and fits in our family so well, we are very blessed! He is now 16 weeks old (wow!) and I have come to learn so much about him. I am now figuring out what his different cries mean, what time he likes to go to sleep, how he likes to be held, which toys he favors and how often he dirties his diapers. I have also come to know alot about his skin and that he tends to have more sensitive skin and has developed baby eczema and cradle cap. Bummer. My daughter, as you all well know, had horrible baby eczema and is now outgrowing it...thankfully. Now, I am working Isaac through it and hopefully, he will have it for less time then Hannah did. New Zealand is clean and pure country. Some specialty products of New Zealand, for example, Manuka honey and Propolis is rare and has healing properties. From ten years ago, we have started using these unique and special natural resources to produce a restorative facial cream. There have been continuous cases of the cream being effective to almost every skin diseases both common and uncommon. Our baby honey range, made with babies in mind, uses Manuka honey and other natural ingredients so babies can also experience the gentle care of Manuka honey. Special natural formulas of Manuka honey, propolis and plan extracts enriched with vitamins to rejuvenate your skin. Our Restorative cream gives you the fabulous look of healthy glowing,beautiful skin. I was really happy to see that the main ingredient in their baby skin care products is honey. When it comes to natural skin care, I have heard that honey is a wonderful healer and I really wish more companies used this in their products! So, for his review I was sent My Honey Shampoo & Bath, My Honey Massage Oil and My Honey Barrier Cream. I just love the soft colors used in the labeling and packaging...this would make a gorgeous baby gift! Bath time is always a fun and relaxing time for Isaac and I was excited to try these products on him! When I bathe my babies, I always wash their hair first. 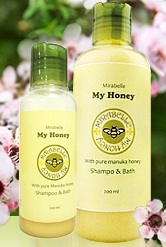 So, the first Mirabelle product I tried was the My Honey Shampoo & Bath. This shampoo contains Manuka Honey, Orange Oil and Aloe as it's main ingredients and smells so great. It is also non-irritating to the eyes. My son's cradle cap is really flaky so I just worked the shampoo into his scalp with a soft brush. After rinsing his hair I washed his body and really loved how the soap made a nice lather. When I took Isaac in to get his pajamas on after his bath, I applied the My Honey Barrier Cream to his bottom, focusing on his cute little folds. Diaper rashes are no fun and so preventing them is key! This cream is light, creamy, non-greasy and contains Manuka Honey, Aloe Vera, Sweet Almond Oil, chamomile and vitamin E. I also tried some of this cream on his eczema and it definitely helped it look less inflamed. To finish off Isaac's after-bath routine, I gave him a nice massage using the My Honey Massage Oil. Oh my goodness. If you could smell this oil you would be totally in love. Yes, it is oil and so it is greasy. BUT, it absorbs quickly and softened Isaac's skin wonderfully. This massage oil contains Calendula Oil and Sweet Almond Oils. Calendula kind of has a floral scent...simply gorgeous and perfect for pampering my baby! So, in my opinion...I love Cult Natural's products! They are very luxurious and nourishing for Isaac;s skin and I really feel that I am giving him the best for his skin. The prices are a bit steep for me; however if you truly want something natural, clean and perfect for baby's skin, you sometimes have to pay a bit more than you are used to paying. I would definitely recommend these products to anyone out there who has children with sensitive skin. Mirabelle is a fantastic line that is sure to impress and take the stress out of caring for your baby. Disclaimer: I received no monetary compensation for this post. I did receive free Cult Natural products for review purposes. All quotes and stock photos are from the Cult Natural website and email. Prize is being provided and shipped by the sponsor. All thoughts and opinions are 100% mine. I'd love to try the My-Honey Shampoo & Bath. the lavender body balm looks nice. I would like to try their Organic Lip Balm that is coming soon! I would love to try the "my honey shampoo and bath". sounds great. I'd like to try lip balm. I'd love to try their Peppermint Lip Balm. But they have so many awesome lip balm flavors/scents it was hard to choose one! I'd like to try the Peppermint Lip Balm. I like their Lavender Body Balm.